My name is Dean Hudson and I’m the President of EngageHi², a healthcare IT solutions provider and service delivery partner to BigML. The phrase “Transforming Healthcare” looms as large as “Big Data” or “Business Intelligence” in the healthcare industry. For years the industry has been throwing around jargon and buzzwords to drive awareness, marketing and sales. We have all heard about the three V’s of Big Data; oops wait now there are four! When we talk about transforming healthcare by providing insight to data more is involved than just volume, veracity, velocity, and variety. Let’s define what I feel the missing V really is: Value! The true value of your data, the insight delivered from that data, and the evidence-based decisions derived from that data is what will transform healthcare! Everyone seems to be focusing on the glitz and buzzwords but not the true building blocks. Those building blocks are the data quality, governance, provenance, and data model – along with other key enablers such as the EKW (enterprise knowledge warehouse). Once we have successfully ironed out the building blocks we can then move to a critical step that achieves true Value from data: the predictive model. Machine learning and predictive modeling will change how we build insight and relationships in healthcare. Predictive analytics is the use of artificial intelligence modeling, statistics, and pattern detection that sifts through mounds of data to identify behavior patterns and using these patterns to gain new insights. The barrier to adopting predictive technologies in healthcare has been cost and complexity – two things that BigML’s machine learning platform uniquely addresses. As someone who has been providing advanced IT solutions to the healthcare industry for 20+ years, I can state unequivocally that tools like BigML stand to revolutionize the way that health networks, hospitals and clinics run their businesses, and – most importantly – provide superior patient care. EngageHi² is proud to partner with BigML to provide the real V (value!) to healthcare organizations of all shapes and sizes. 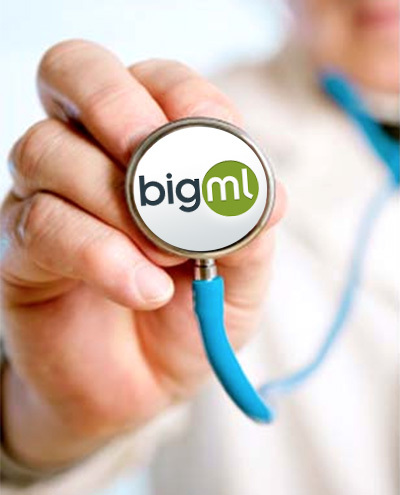 We’re actively working on implementations that will leverage BigML’s intuitive workflow and rich visualizations for solutions ranging from patient diagnoses to readmission predictions to quality of care analysis. Healthcare will transform and outcomes will improve, but the industry requires solutions that accurately deliver the value, and not just buzzwords!